Part PAC10. Ideal for delicate woodcarving yet durable enough to withstand tough jobs. 2 x Straight Chisels - 6.3 and 12.7 mm blade widths. STRAIGHT CHISELS. Hardwood walnut handles with deeply seated tangs & brass ferrules. Not very sharp when you get them but great starter set , can't put them down fit in the hand great. I am not an expert carver (just beginning) but these chisels are really good value for money, and once I had them expertly sharpened they have been brilliant. Save your $ for better quality. I had hoped for an exceptional value but was disappointed. 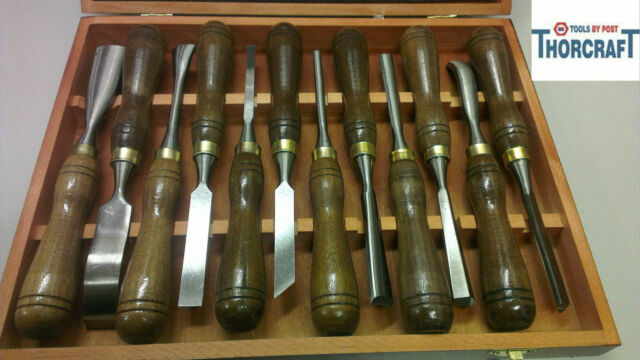 The chisels came completely blunt edged. Handles not ergonomic. Definitely not Marples quality.